Immigrant advocate groups had launched a public-relations campaign to urge release of the deliveryman within days of his arrest. A federal judge has given a last-minute reprieve to a New York City restaurant worker who was fast-tracked for deportation this month, after he showed up at an Army base with a delivery of pasta and the wrong type of ID. Pablo Villavicencio, along with his wife and two young American daughters, has become a live chip in the political fight over deportations since he was arrested on a years-old immigration warrant less than two weeks ago. Saturday's court order temporarily halting Villavicencio's immediate removal to Ecuador means that his allies, including New York Gov. Andrew Cuomo and Democratic lawmakers, will have at least another month to try to free him from federal custody. Villavicencio entered the United States illegally in 2008, in his mid-20s, according to the New York Times. He has committed no crimes since then, a spokeswoman for Immigration Customs and Enforcement told the newspaper, but an immigration judge ordered him to leave the country in 2010. Instead, he got married and started a family in New York - where local laws somewhat shield undocumented immigrants from federal authorities, even as President Donald Trump's administration detains thousands of people it accuses of entering the United States illegally. Villavicencio knew he was a fugitive, always at risk of deportation, the Times wrote. But by age 35, after years with no trouble, he had settled into a routine of family life and a job working at a Queens pizzeria called Nonna Delia's. Fort Hamilton, a small Army garrison in Brooklyn, was about an hour from the restaurant. But a sergeant there regularly placed bulk orders, the New York Post wrote, and Villavicencio was used to the trip when he pulled up to the checkpoint around lunchtime on Friday, June 1. He later told the Post that he flashed his city ID card at the guard, as he had done before. But "there was a different security guard," Villavicencio said, and an official began to question him - first asking for a driver's license, then a Social Security card, then calling police to ask about his background and discovering the old ICE warrant. An Army spokeswoman later told the Times that anyone trying to enter the base without a military ID gets a check, but Villavicencio said the sergeant came to the checkpoint and tried to stop his interrogation. "The sergeant was telling the man ... he had no business calling ICE," Villavicencio told the Post. "He just has to verify I had no problems and let (me) through." Instead, the Times reported, the sergeant phoned Villavicencio's wife, Sandra Chica, and broke the news that he'd been arrested. 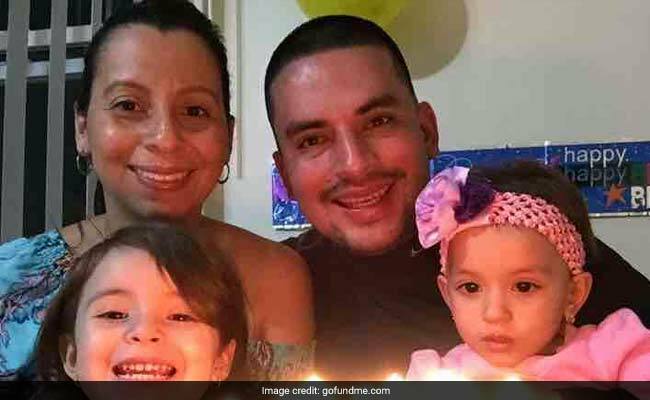 Villavicencio was taken to a New Jersey jail to await deportation, and his wife said she went to the base to collect his car, where she learned soldiers had still eaten the pasta. Immigrant advocate groups launched a public-relations campaign to urge release of the deliveryman within days of his arrest. "He's the center of our family. He's the main support," Chica pleaded in a Twitter video. "We're really going to suffer if he's deported." Two New York City officials joined her and the couple's 2- and 3-year-old daughters for a news conference in front of the Army base. "Is our city, state and nation any safer today because they took a pizza delivery guy off the streets?" City Council member Justin Brannan asked the cameras. Not everyone was sympathetic to Villavicencio. "He promised a judge that he would leave the country within two months, and instead he chose to stay for eight years," Jim Geraghty wrote in the National Review. "He might be a swell guy with adorable daughters, but ... what should be the consequence of not keeping a promise to a judge and defying a legal order for nearly a decade?" "I am writing to request that your office launch an investigation into the conduct of ICE agents to ensure they are abiding by the rule of law," Cuomo wrote. "His arrest and detention appears to be a result of ethnic profiling and does nothing to make our communities safer." The same day, the Legal Aid Society of New York filed a petition with ICE to halt the deportation, the Times wrote. Villavicencio's lawyer asked the agency for leniency, writing that he was his family's main breadwinner and that his younger daughter had a congenital heart defect. If those efforts moved the federal government, it was not apparent. On Friday night, the Times wrote, ICE cleared Villavicencio for an immediate flight to Ecuador. In a last-ditch attempt to keep him in the country, the lawyers asked a federal judge to temporarily block the deportation over the weekend. And on Saturday, they announced Villavicencio's first victory since the pasta order came in. The judge ordered the federal government to submit reasons Villavicencio should be immediately deported and scheduled a hearing for July 20, buying the jailed Ecuadoran and his supporters a few more weeks to look for a way to keep him in the country. The ruling is "a reminder that the judiciary can still serve as a powerful check when other branches of government make hasty, cruel and reckless decisions," Legal Aid's supervising immigration attorney told the Associated Press.